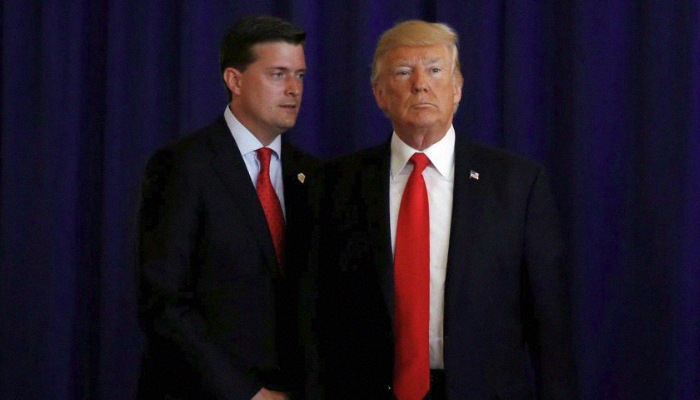 White House Staff Secretary Rob Porter (L) and US President Donald Trump in Bedminster, New Jersey, US, August 12, 2017. WASHINGTON: US President Donald Trump on Friday praised White House aide Rob Porter, who resigned this week after allegations that he abused two former wives, and stressed that Porter has maintained his innocence. “He says he’s innocent, and I think you have to remember that. He said very strongly yesterday that he’s innocent,” Trump told reporters in the Oval Office. Trump did not express any sympathy for the two women who this week provided graphic accounts of the verbal and physical abuse they said they suffered while married to Porter. Trump said he found out about the allegations recently and was “surprised” by them. Porter’s resignation on Wednesday has raised questions about how long it took the White House to act on the accusations. Some senior White House officials were generally aware of the allegations before Trump found out a report surfaced on DailyMail.com, a source familiar with the matter said. White House Chief of Staff John Kelly has so far taken the brunt of the blame. Kelly and Press Secretary Sarah Sanders both issued statements calling Porter a man of “integrity” in response to an initial Daily Mail report that Porter’s two former wives had accused him of abuse. Kelly later put out a statement saying he was shocked by “new” allegations against Porter, stressing that domestic violence is unacceptable. Trump has been privately complaining about Kelly and wondering whether to replace him, according to two sources familiar with the matter. “If he (Trump) draws scrutiny to himself, he’s OK with that. But when the staff draws scrutiny to him, he does not appreciate that,” said one of the sources, speaking on condition of anonymity. White House spokesman Raj Shah said on Thursday that Kelly was not “fully aware” of the extent of the allegations against Porter until photographs of one of his former wives with a black eye emerged on Wednesday. Shah also conceded the crisis could have been better handled by senior White House officials. Reuters has not independently confirmed the allegations. As White House staff secretary, Porter was responsible for reviewing all documents signed by the president, from legislation to executive orders. The position put him in close contact with the president and required a security clearance but Porter, a Harvard Law School graduate, had not yet been approved for a security clearance because the required background check was still ongoing. Jennie Willoughby, one of Porter’s ex-wives, said in an interview with NBC’s Todayshow on Friday that she told the Federal Bureau of Investigation during Porter’s background check that he had been abusive toward her. “Of course, I was part of the background check and I was completely honest with what my experience of the marriage, including telling the police instances of abuse or police contact,” said Willoughby.